Podiatry Associates of Houston (Woodlands) - Book Appointment Online! 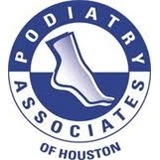 Welcome to Podiatry Associates of Houston, a private practice serving the Central, West and Northwest Houston areas. Drs. Michael A. Mineo, David Blumfield, and Jorge Matuk offer expert and professional podiatric services and are dedicated to the diagnostic, therapeutic and surgical correction of ankle and foot disorders. The physicians at Podiatry Associates of Houston provide several types of podiatric specialties, including but not limited to the following: ~ Primary Care ~ Pediatrics ~ Surgery ~ Sports Medicine ~ Biomechanics ~ Trauma As part of our commitment to patient care and education, we hope visitors to our site will consult the pages available to find out more about our practice and services. Thank you for visiting and please feel free to call us with any questions. Dr. Douglas Hansen is excellent. Very friendly and caring approach. Explains things clearly and systematically... I strongly recommend Dr.Douglas. Great Bedside Manner and explains everything that is going on and what to expect. I would definitely go back to him and recommend him. I think highly of him. Knowledgeable and personable. Great doctor. the Dr. was very professional, and courteous, good bedside manners, and answered all of my questions. my first visit was very good.